to Your School or Organization ! 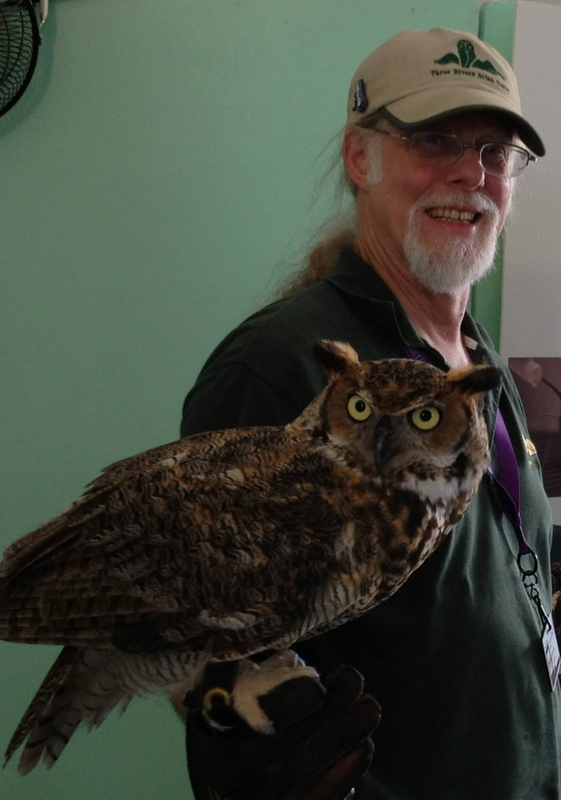 Our most popular program is "Wings of Wonder - West Virginia Birds of Prey", which runs 45 minutes to an hour during which each bird is presented, on the glove, one at at time (pictured to the right and below). Each bird's case history is explained, followed by questions from the audience. This allows us to tailor the content and present according to the age and educational level to which we are presenting. The 6 birds we bring represent the Hawks, Eagles, Falcons, and Owls. The case histories of each of these non-releasable birds act as a platform to discuss not just the reason they can not be returned to the wild, but also some possible ways people can help wild birds avoid the problems they face as they adapt to the changing world around them. We can also present a "static" display (pictured above) in which we have handlers with perched birds and informational materials ready to engage participants as they come to our display. This format is good for gatherings where participants move from booth to booth, such as at a festival. You will receive an invioce, contract, and an invoice number. You may then pay in advance or at the program, or pay on line with your credit card or PayPal by clicking on the 'Pay for a TRAC Education Program From an Invoice' button below. In the comments box, please including your contract/invoice # as well as any special information that would be useful. To see photos of our All of Our Education Ambassadors, click here! In addition to the regularly scheduled tour days, the Center is available for private tours as scheduling allows. 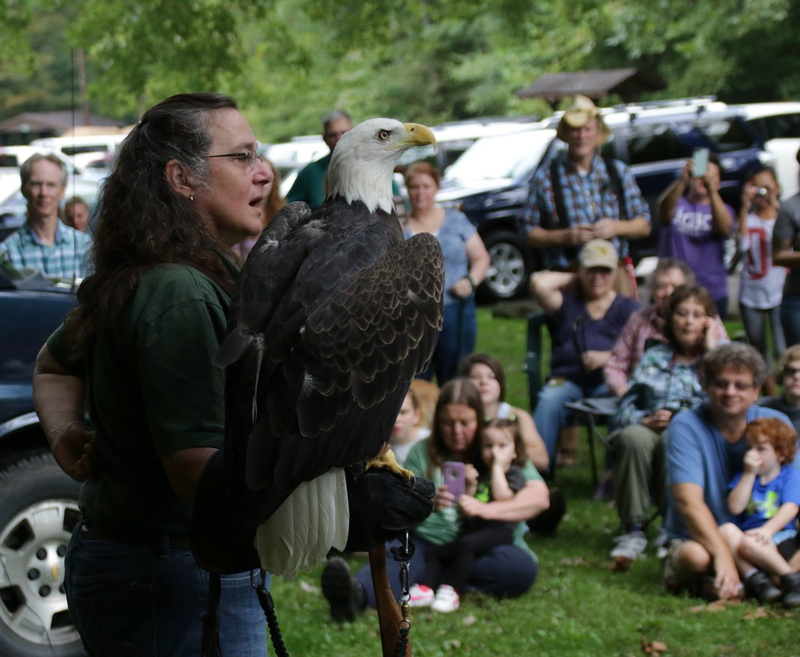 Over the years, TRAC has won awards from the West Virginia DNR Wildlife Diversity Program, The New River Gorge National River, The Huntington Tri-State Audubon Society, Study Web, and the Charleston Gazette. In addition, TRAC's main presenters, Executive Director Wendy Perrone and Educational Director Ron Perrone have both received the Distinguished Mountaineer award from Governor Joe Manchin III for their positive and proactive work in environmental education and wild bird care. TRAC publishes a quarterly newsletter "The Raptor Chapter" which is filled with information on various wild bird species, TRAC events and happenings,and other useful information to those interested in wild birds and other wildlife topics.